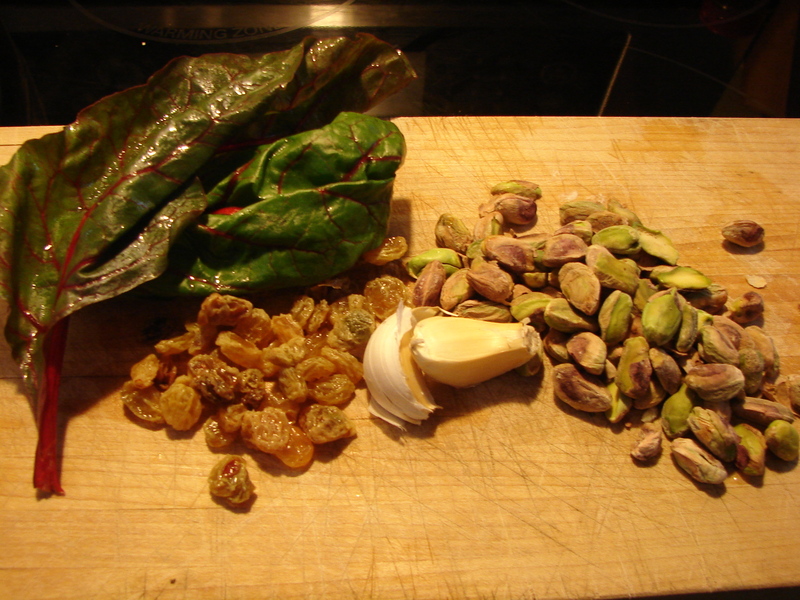 When I was in Spain quite a few years ago, I stopped at a place with only one vegetarian thing on the menu – spinach, raisins, and pine nuts. It was such a simple dish, and I had such a heaping mound of spinach on my plate, but somehow it was one of the most memorable and delicious meals I have ever eaten. 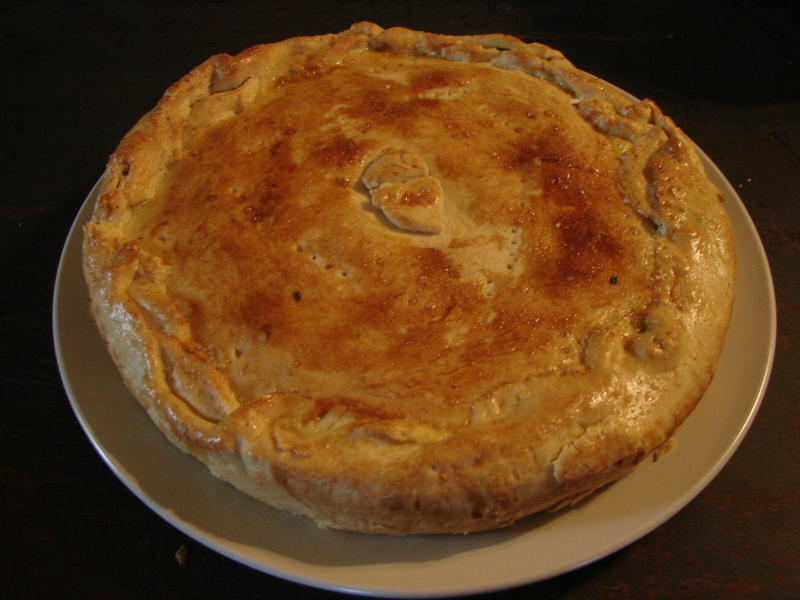 The filling for this pie is loosely based on that memory. 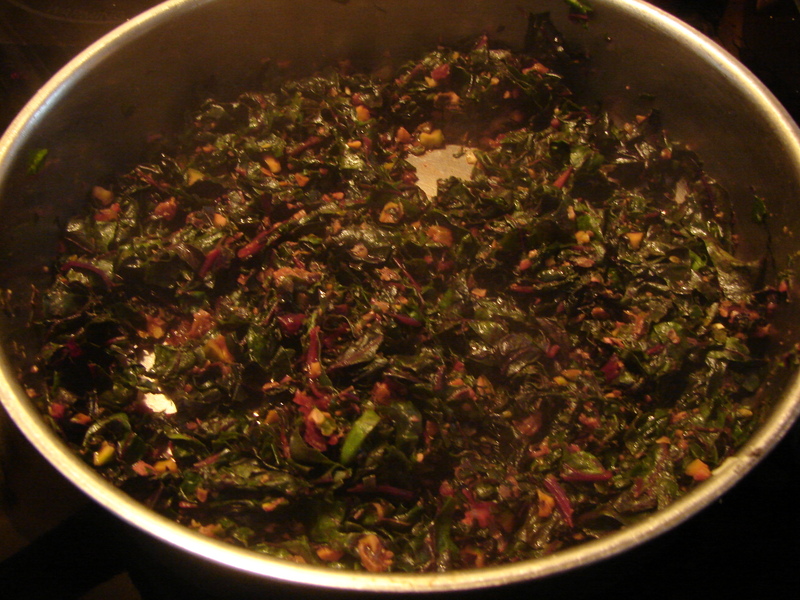 I used chard instead of spinach, because of the added depth of earthy flavor, and because it seems more substantial. And I added pistachios, quite frankly, because I had them! You could just as easily use spinach and pine nuts. The flavor would be different but equally delicious. I added lemon zest to this light yeasted crust, because I think the brightness of lemon zest contrasts nicely with the earthiness of the chard. Here’s Swiss Chard, by Ed’s Redeeming Qualities, a band we used to listen to when we lived in Boston. I hadn’t thought about them in a while. Thank you, swiss chard, for reminding me!! 1. dissolve the yeast and sugar in 1/3 cup warm water. Let it sit for a few minutes till it gets foamy. 2. In a large bowl, mix the flour with the salt, rosemary (finely chopped), pepper and lemon zest. Form a hole in the center, and add the yeast & water mixture and the olive oil. Pull together into a ball, adding water as needed to make it into a smooth dough. Knead for about 5 minutes, till smooth and elastic, and then put it in a large bowl covered with a wet cloth. Set it aside to rest and ponder life as a lump of delicious dough. It will double in bulk, over a couple of hours, and become soft and pudgy, but it will never be quite as light and airy as bread dough. Just before you start to put all of the other ingredients together, punch it down and let it sit again. 1 large bunch of swiss chard, stems removed (I use my hands rather than a knife, holding onto the stem with one hand and tearing the green of the leaves away with the other) and diced quite finely (1/2 to 1 inch squares) Should be 4 or 5 cups when you’re done. 2 heaping T. golden raisins, soaked in cold water till plump (10 minutes or so), and then chopped into little pieces. 1. Warm the olive oil in a large saucepan. 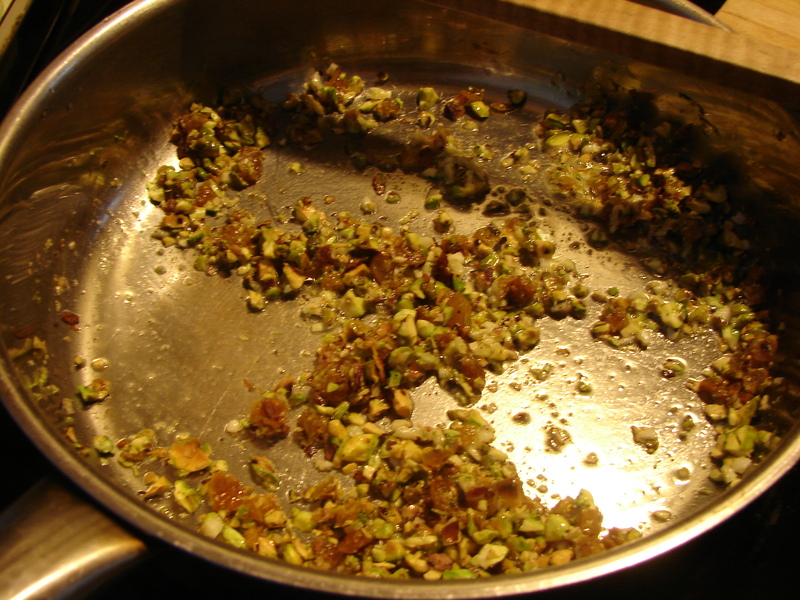 Add the garlic, let it sizzle a minute or so, then add the raisins and the pistachios. Don’t let anything burn! 2. Add the chard, with the water from washing it still clinging to the leaves, and stir it gently from time to time until everything is dark and cooked through. 5 – 10 minutes. It will “cook down,” but not as much as spinach does. 3. Put it in a large bowl, stir in the cheeses and lots of freshly ground pepper. Add salt to taste. 4. beat two eggs in a small bowl. Pour all about about 1 T into the chard/cheese mixture, and stir them in well. 5. Divide the dough into two balls, at about a 3/4 to 1/4 ratio. Roll the larger one out quite thin – maybe 1/8th inch. If you make it too thick it will become bready. And this dough is very stretchy and easy to work with. Line a straight-edged cake or tart pan (that has been lightly greased) with the dough. Spread the filling evenly inside. 6. 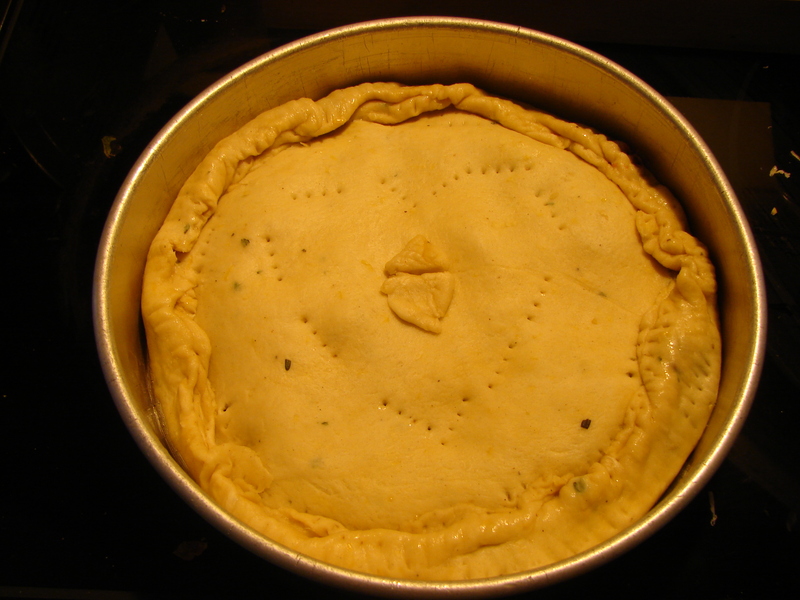 Roll out the smaller ball of dough, and put this on top of the pie. Roll the edges together all around the pie, and then use a fork to really stick them together and give them a pretty pattern. 6. Brush with the remaining 1 T of egg, and poke a few air holes. Bake at 425 for about 1/2 hour – 40 minutes, till it’s deeply golden on top and pulling away from the sides of the pan. 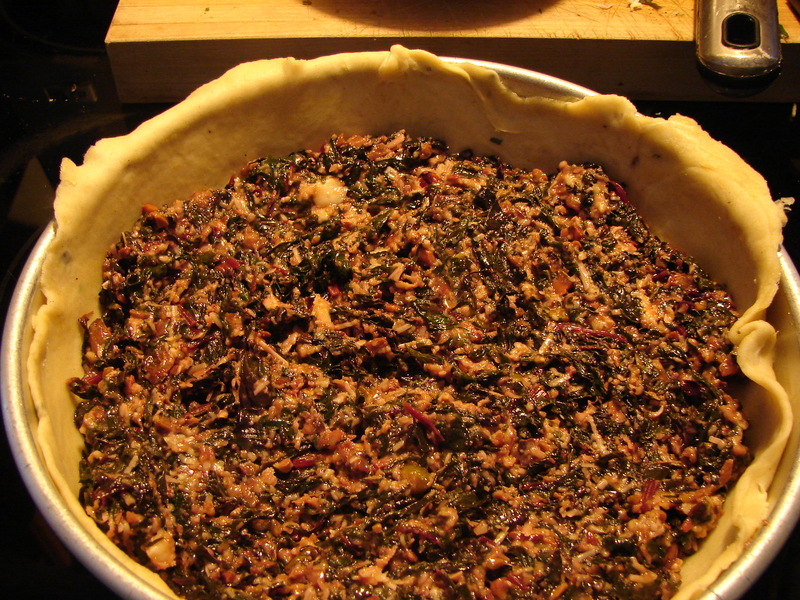 This entry was posted in crust, pie, recipe and tagged chard, Ed's Redeeming Qualities, golden raisin, pistachio, savory pie by Claire. Bookmark the permalink. This sounds great. I think the combination of earthy greens with nuts and fruit is great in savory dishes like this.